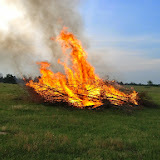 I spent Memorial Day Weekend helping a college classmate 'burn stuff' at his family farm in East Texas. Burning off the old is indeed metaphorically renewing and invigorating physically as well. There were seven piles of trees/brush stored up as a result of the recent two year severe Texas drought, which has eased considerably in East Texas...Sadly, the drought remains in West Texas and even moreso in New Mexico. This work was done in preparation for a wedding ceremony to be held at the farm in 2014. I feel like we opened the road to 'many happy returns'. 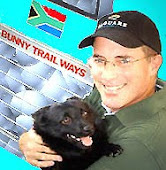 This Picasa (now Google) Gallery includes The Burn, the family 'log house', 'stone house', flora and fauna of rejuvenated and green East Texas, and shots of the family's new pup, Franklin. Click for a Quick link to The Burn.